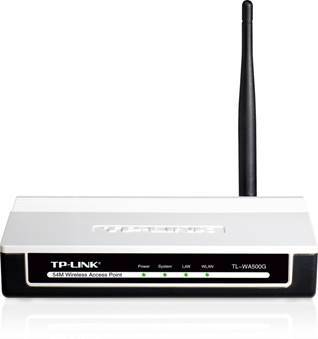 The TP Link’s TL-WA500G is a typical wireless solution for the small office home office (SOHO) setup. It is a wireless G access point with just the right features to transform a restricted wired home network to an equally secure wireless network. Despite the complexfeatures, the device is very easy to configure hence one can setup the home network all by themselves. Wireless Specifications: The TL-WA500G is a single band wireless G router that operates in the 2.4GHz range. It is backward compatible with the wireless B or 802.11b standard hence, even the relatively older devices can connect to the network. The theoretical throughput of the wireless G standard is 54 Mbps and TL-WA500G can offer similar speeds. It can auto negotiate the actual throughput with the wireless device on the fly based on the interference and other factors to deliver the optimum wireless experience. It comes with an eXtended RangeTM technology that can enhance the wireless network range by 2-3 times the typical wireless G range. The product’s range was tested up to 855m in China giving it a pretty decent coverage area for a SOHO environment. The actual transmission area can be extended by up to 4 to 9 times which is pretty significant. Wireless Security: The TL-WA500G comes with a series of wireless security encryption standards making it a great fit for the home office use. It supports the WEP or Wired Equivalent Privacy standard with keys ranging from 64-bit to 152-bit in length. The 152-bit key encryption is by far the most secure solution in the WEP standard in the market. However, WEP in itself is a very weak protocol and the only reason for using it would be that it is supported by most wireless devices by default. The more secure encryption standard today is the Wi-Fi Protected Access (WPA) and the TL-WA500G supports multiple flavors of this the same – it supports WPA, WPA2, WPA-PSK and WPA2-PSK giving the user ample alternatives to secure the wireless network. Typically, more than the access point, the devices connecting to the network determine the encryption standard to be deployed. The device also supports SSID broadcast toggling to allow the users to determine if the wireless network name should be publicly displayed or not. Sometimes, a simple thing like, disabling SSID broadcast can help reduce the threat of intrusions to a great extent. The TL-WA500G also supports MAC Address filtering that allows it to determine the access level for various connected devices based on their MAC addresses. Wireless Operating Modes: The TL-WA500G supports multiple operating modes to suit the varying needs of different wireless network configurations. The table below summarizes the various operating modes for this access point. Accessing the Configuration Setup: The default IP address of this access point is set to 192.168.1.254 with DHCP client mode disabled. Hence to access the configuration setup of this device, it needs to be connected directly to a computer. To ensure that the computer can communicate with the TL-WA500G properly, its IP address and subnet mask of the must be manually set to a static address in the same subnet – say 192.168.1.251 with a mask of 255.255.255.0. After setting up the computer, follow the steps below to access and set the parameters for the access point and the wireless network. 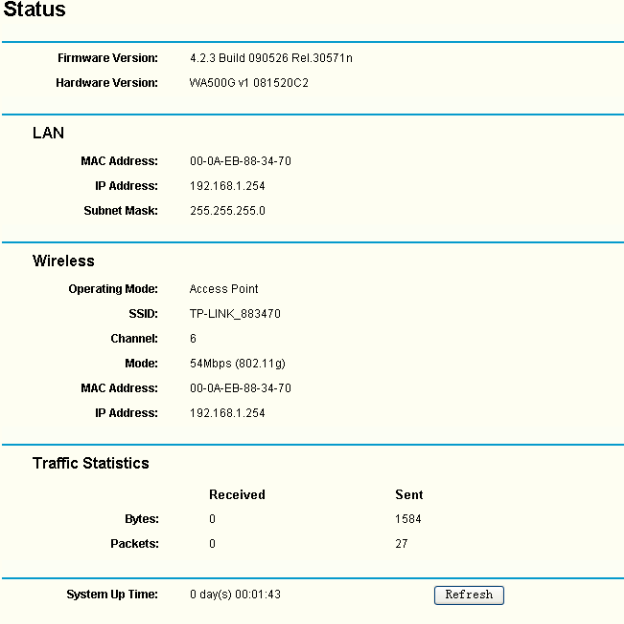 This will display the page with the status of the access point. From this screen, one can navigate to any other menu item to configure various parameters of the access point.